During the late sixties, Ferraris road-oriented berlinettas split in terms of design from their race cars. After the 250 short wheelbase berlinetta, the dual purpose road / race Ferrari seemed gone. This new distinction motivated Ferrari to manufacture more civil road cars having impressive specification. The first example of this new trend was the 275 GTB. As unveiled at the 1964 Paris Motor Show, the 275 sported race-inspired engineering. Features such as all-independent suspension, four-wheel disc brakes, a five speed transaxle and an optional alloy body distinguished the 275 from the much larger and heavier 330 GTC built beside it. 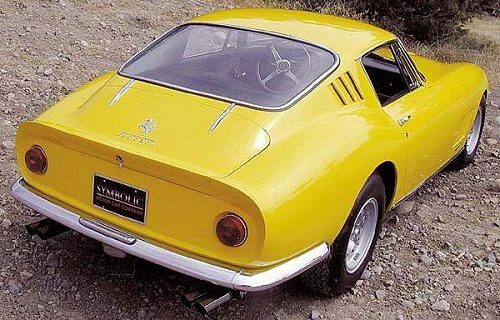 Being light, powerful and strikingly beautiful, the 275 was a very successful car for Ferrari. It sold well, with around 1000 examples made, and, as an afterthought, scored victories in endurance racing after the 250 LM was denied homologation. In 1966 the 275 GTB was re-introduced with a four-cam version of the V12. Six Webber carburetors aided in delivering around 300 horsepower. To cope with the new power, the GTB/4 was given wider tires and a ZF limited-slip differential.